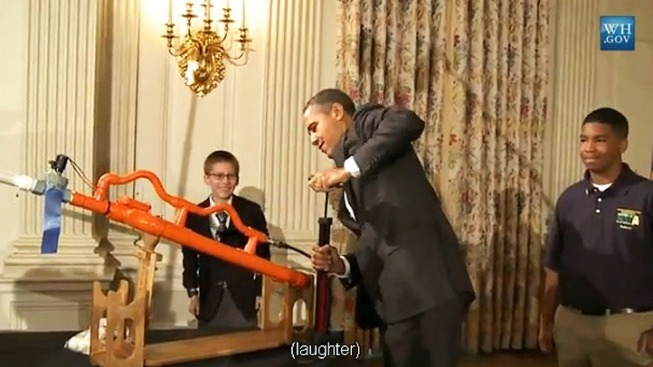 President Barack Obama initiated an impromptu marshmallow launching in the dining room of the White House on Tuesday. "The Secret Service isn't happy about this," he noted. But hey, it was for a good cause, all right? It was for science. Hudy's cannon involved using a bicycle pump to increase the pressure to 30 PSI before launching. Obama stepped up to help pump, saying he felt like an assistant. When it was time to launch, Hudy noted, "I'll probably angle it this way so it doesn't hit that person [over] there." "Yeah, I think that's good," Obama replied, drawing laughs from the crowd. The marshmallow launching as a total success: Not only did it fly across the room, but no one was injured, and the marshmallow was still relatively intact to be reused, or deployed as a S'more later in life.